The research and accomplishments in the latest years of our group can be also summarized as four parts, including high performance triboelectric nanogenerator, hybrid energy harvesting technology, high efficiency power management technology for energy harvesting system, and self-powered active sensing technology & multi-functional smart skin. 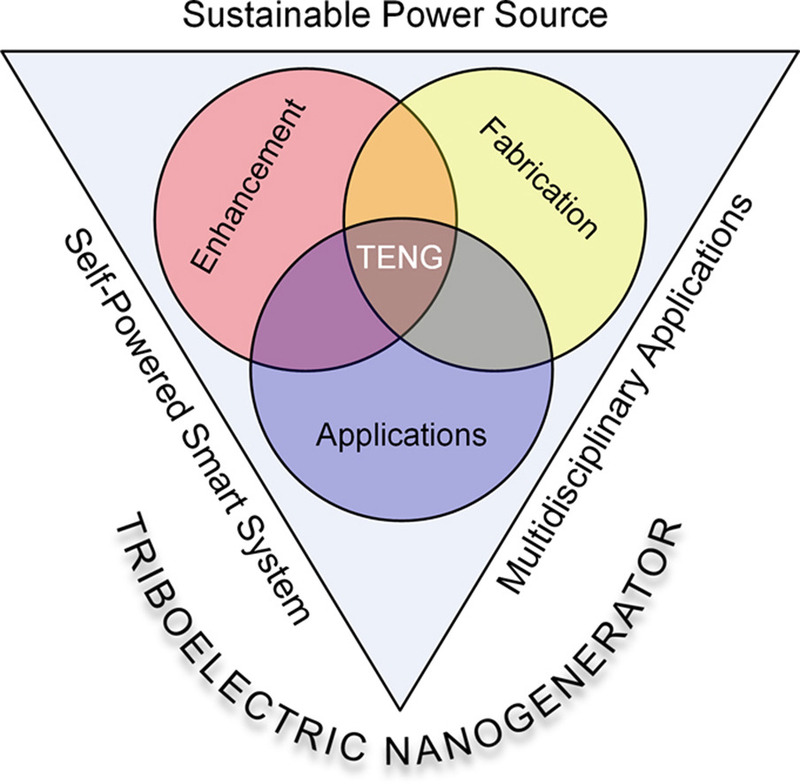 Zhang invented the high performance Triboelectric Nanogenerators (TENGs). Developing novel energy harvesting technologies is the key for long term stability of MEMS/NEMS and IoT systems. It is highly desired for. 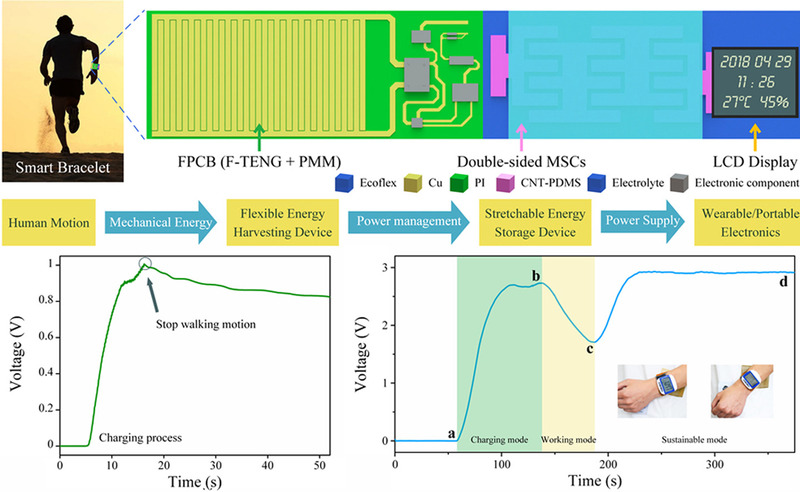 Zhang developed the first Sandwich-typed TENG with micro-nano dual structure surface (Nano Letters, 2013, 13, 1168-1172), which has high output voltage 465V, current 107.5μA, power density achieved 53.4mW/cm3, and she introduced controllable surface treatment technologies to enlarge the friction surface and enhance surface charge density (Nano Energy, 2014, 4, 123-131; Nano Energy, 2015, 11, 304-322). She is the first investigator of surface energy by using first-principle calculations (Langmiur, 2013, 29, 10769-10775). Zhang invented the first transparent and flexible single-friction-surface triboelectric generator (STEG) (EES, 2013, 11, 3235-3240), which achieved the open-circuit voltage 130 V with a short-circuit current density of about 1mAcm-2. She developed the first electrode-free TENG for harvesting biomechanical energy from motions, the electricity can be obtained from any part of human body, The output voltage 810 V is achieved and charge over 550 nC is transferred in one step of an adult's walking (Nano Energy, 2015, 12, 19-25). Zhang demonstrated the large scale fabrication and performance enhancement strategies of TENGs based on MEMS and IC fabrication technologies (Nano Energy, 2013, 11, 1101-1106), such as DRIE and FPCB, which opened the market of TENGs in many applications. Zhang pioneered the field of hybrid energy harvesting technology. In order to harvest the environment energy in High efficiency, Zhang first invented the hybrid nanogenerator which made the simple r-shaped structure can harvest the energy both by triboelectric/piezo principle (ACS Nano, 2013, 10, 8554-8560), enhance the output of PENG and TENG can achieved 10.95mW/cm3与2.04mW/cm3 respectively. Later on, she invented the wavy-shaped structure which can drive 3 hybrid nanogenerators, it can charge a 1uF capacitor to 25V in 1mins (Nanoscale, 2017, 9, 1263-1270). In addition, Zhang developed the Magnetic-Triboelectric hybrid generator to harvest the vibration energy from all directions, it can fully charge a 20μF to 7V in 200s (Scientific Reports, 2014, 4, 4811). These research works possess unique characteristics such as the dependence of configurations, the controllable enhancing/weakening trend and amplitude, and multi-level output (AEM, 2015, 1500187), opens a window in exploring the high efficiency energy harvester to meet the needs of long term power supply. Zhang first discovered the high efficiency power management technology for TENGs. TENG has emerging as an important approach for energy harvesting. However, low charging efficiency as well as low power conversion efficiency have restricted its practical application for powering traditional electronics, Zhang invented a power management (PM) strategy by extracting maximum energy from TENG and transferring the energy to storage unit employing optimized Inductor-Capacitor (LC) oscillating (Nano Energy, 2017, 38, 438-446). Over 2600 times improvement in stored energy than standard circuit was achieved, and more than 72% alternating current (AC) to direct current (DC) power transfer efficiency was obtained for different modes TENGs. In addition, she implemented an integrated self-charging power unit (SCPU) with a triboelectric nanogenerator and supercapacitor (JMCA, 2016, 4, 14298) which can simultaneously harvest and store energy during ambient vibration process. Several high quality supercapacitors were developed to match different applications, such as, reestanding Micro-Supercapacitor With Interdigital Electrodes for Low-Power Electronic Systems (JMEMS, 2017, 26/5, 1055-1061), All-fabric-based wearable self-charging power cloth (APL, 2017, 111, 073901), Highly Compressible Integrated Supercapacitor-Piezoresistance-Sensor System for long term health monitoring (Small, 2017, 1702091). This Power Unit provides a feasible solution for sustainable power supply and shows great potential in micro-energy fields and self-powered systems. Zhang pioneered the original idea of active sensing technology by combing electrification and electric-static and piezoelectric effect, for monitoring the weak signals, such as, position, motion, temperature, humidity, respiratory information and radial artery pulse, etc (Nano Energy, 2017, 32, 479-487; APL, 2018, 112, 203902). Zhang first proposed the self-powered analogue smart skin for detecting contact location and velocity of the object, its resolution can be achieved at 1.9 mm in 25cm3 area with only four terminals (ACS NANO, 2016, 10/4, 4083-4091). Zhang invented the first non-contact self-powered e-skin, it can serve as a human machine interface due to its ability to sense noncontact motions (AFM, 2018, 28, 1704641). Inspired by Finger anatomical structure, Zhang developed several finger-like e-skin devices, which can execute many complicated tasks and greatly expands the applications (Nano Energy, 2017,40, 65-72; AFM, 2017, 27, 1604434). Her continues discovery and breakthroughs in developing simple structure and high integration devices for self-powered active systems and push them closer to practical applications such as flexible electronics, wearable electronics, implantable device, etc. 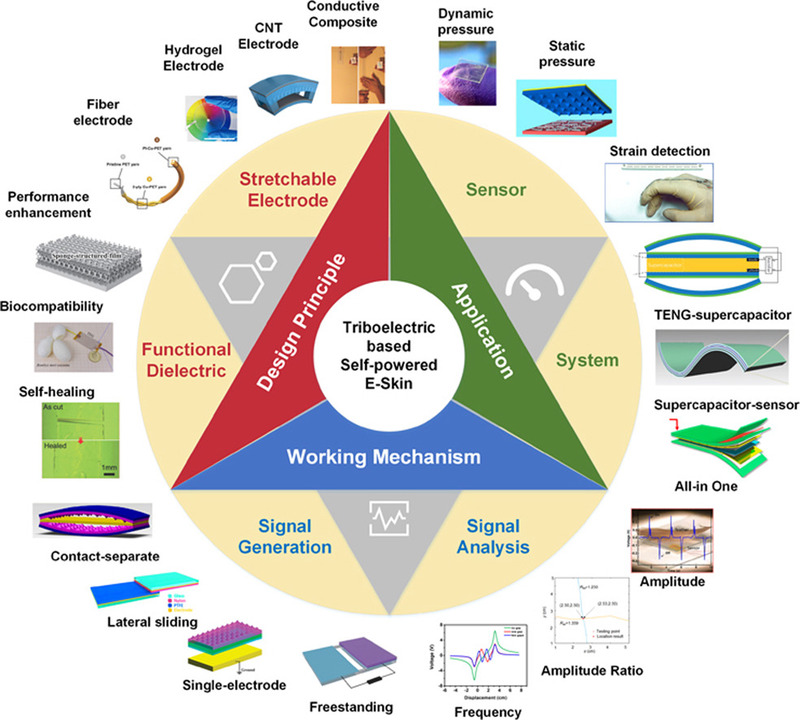 Dr. Zhang initiated the “all-in-one self-powered flexible microsystems” (Nano Energy, 2018, 47, 410-426) by introducing the technology of TENG around the following major categories: working principles, advanced materials, active sensors, actuators, et al, which has inspired the worldwide trend of integrated microsystems.